Served with Citation to Appear in Surrogate’s Court. What Do I do now? I was Served with Citation to Appear in Surrogate’s Court. What Do I do now? If you were served with Citation, that means you have been determined to be a necessary party to a proceeding. A Citation is one of the most basic ways that a Court obtains jurisdiction over you. If a Court has jurisdiction over you, it means that the Court has the ability to make decisions that you will be bound by and will have to obey. You are not necessarily in trouble. The Court just wants to see you and hear from you. A Will is being offered for Probate and you are a necessary party to the proceeding. For example, if your mother’s will is being, you, as a child, are the next of kin, and the Court requires jurisdiction over you prior to proceeding with the probate of the Will. The Court wants to know whether you are consenting or objecting to the probate. Somebody is seeking Letters of Administration, and you are a distributee. For example, if your parent died without a Will and your sibling is attempting to become the fiduciary of your parents’ estate, you, the Court requires jurisdiction over you prior to authorizing your sibling to act as fiduciary. The Court wants to know whether you are consenting or objecting to your sibling serving as a fiduciary. Somebody is looking for an accounting and you are an interested party to the accounting. For example, if your sibling was previously the Executor of your parents’ estate and now wants to settle their affairs as Executor, the Court requires jurisdiction over you prior to approving of the accounting. The Court wants to know whether you, as a beneficiary of the estate, and as a person entitled to some of the money from the estate, are consenting or objecting to the accounting. Somebody is looking for you to pay a claim and the Court wants to know whether or not you are going to pay it. For example, if a creditor wants to be paid for expenses that the creditor incurred on behalf of the Decedent and you are unwilling to make payment, then the Court requires jurisdiction over you prior to so ordering such payment. The Court needs to know whether you are consenting or objecting to the Creditor’s claim payment. Somebody is seeking information about the whereabouts of funds from an estate and they believe you have information. For example, prior to your siblings’ death, you held a power of attorney over your sibling and removed money from the Decedent’s bank account. Your surviving sibling believes that you just stole the money. The Court requires jurisdiction over you before determining whether you used the money for your siblings’ care in dying days or whether you stole the money. What Information Does the Citation Contain? The date that it was issued. The person who is the petitioner in the proceeding and who requested the Citation be issued. How can you be Served with a Citation? If you live in New York, Surrogate’s Court procedure requires that a Citation be personally handed to you. 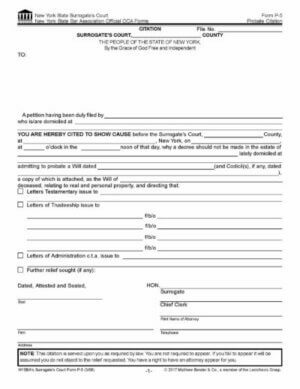 This typically means that a process server will show up at your door and hand you the paper. The Citation must be served upon you at least ten (10) days prior to the date that you are required to appear in Court. If you live outside of New York, Surrogate’s Court procedure requires that a Citation be sent to you via Certified Mail, Return Receipt Requested. The Citation must be served upon you at least twenty (20) days prior to the date that you are required to appear in Court. What Should You Do When you are Served with Citation? If you want to know more about the reason the Citation was issued, you may want to go to the Surrogate’s Court records room in the borough that issued the Citation and look up the Petition. If you are unable to check the record room, but still want to know what the Petition says, you can try to contact the attorney at the bottom of the Citation. However, when you do this, be careful to just ask for a copy of the Petition and not volunteer any other information or answer any of the other questions until you have reviewed the Petition. If you believe that you are not able to contact the attorney without divulging any information, then I recommend that you not Contact the attorney. Go to Court and ask for an explanation of what this is all about. Typically, if you tell the Judge you do not understand what the proceeding, the Judge will send you out with a Court attorney for a conference. Do Not Get Nervous. Contact an Attorney to help you.